You're at your wits' end. Your cat is scratching up your sofa, your carpet, and your door frames. 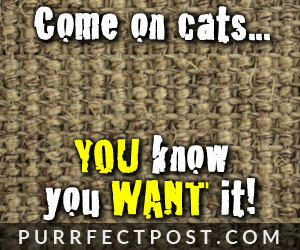 You know you need a scratching post, but there are so many options out there. How do you know which one will work to keep your cat from destroying your house rather than end up being a big waste of money? Scratching is an essential part of a cat's mental and physical health. Scratching allows a cat to stretch and work all of the muscles and tendons from her toes to her neck. A cat marks her territory by scratching. There are scent glands in your cat's paws that let her claim the space she scratches as hers. The physical scratch marks leave a message for other cats, too. This is an extremely important thing to a cat. Being able to mark her territory will leave your cat more relaxed and confident, decreasing her desire to perform other unwanted behaviors in your home. It feels good. Cats love to scratch because it just makes them feel good, physically and mentally. A declaw surgery is the amputation up to the first joint of each of your cat's toes. It involves a painful recovery, risks of infection, bleeding, and opening of the incisions during recovery, and it removes your cat's ability to act as a cat. Cats walk and balance on their toes, not the bottoms of their feet, so removing the tips of these digits may leave them prone to injury when they lose their balance while jumping and trying to climb. You can learn more about the effects declawing has on cats here: "Declawing Cats: Alternatives to an Inhumane Procedure." Scratching posts provide an outlet for your cat's normal and necessary scratching urges. They spare your furniture and other household items from being damaged by a cat that is just being a cat. A good scratching post will have the characteristics listed here. Height: Cat scratching posts need to be tall. Your cat should be able to stand on her hind legs and fully extend her body up the side of the post. That way, she can get a great full-body stretch. If there's a perch at the top of the post so your cat can look out the window while she's on it, so much the better. 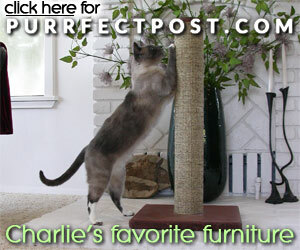 Sturdiness: Your cat will want an extremely sturdy post. If she rises up on her hind legs, places her front feet against the post in anticipation of a good scratch, and feels the post wobble, she is likely to never attempt using it again. In the wild, trees are the most common cat scratching posts, and they don't topple over when a cat leans into a good scratch. In fact, wobbly but heavy posts can be dangerous for cats, especially kittens. A kitten that throws her entire body two feet up the post only to have it fall over onto her could be seriously injured or even killed. Great surface: A good scratching post from the point of view of your cat is one that is covered in a material that's good for scratching. This means that she can sink her nails deeply into it, it isn't sharp, and it shreds beneath her nails. Sisal is an excellent choice of material with which to cover a scratching post. It is made from the Agave sisalana plant that is native to southern Mexico but can be cultivated to grow in many places around the world. The material is sustainable and biodegradable. It is also used to make carpets and rugs. When it is used for scratching posts, sisal is strong and rough, with a similar consistency and feeling for your cat as tree bark, a favorite scratching substrate for wild felines. 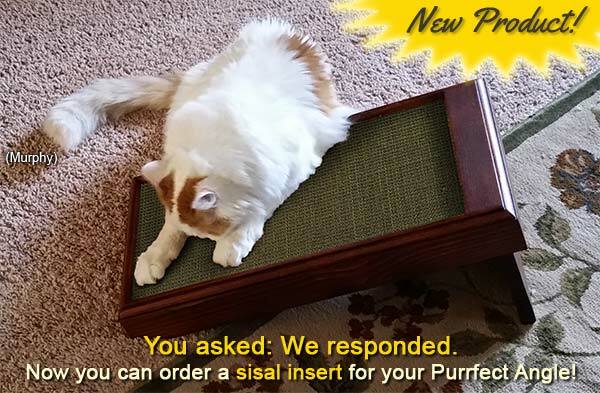 Sisal is quite durable, and it can last on your scratching post for years before needing to be replaced, depending on how many cats are enjoying it. Carpet doesn't shred when a cat scratches at it. Instead, it usually catches the cat's claws and pulls on her toes. This is upsetting to her and often results in avoidance of the post. Many people who believe their cat won't use a scratching post have only provided carpet-covered varieties. Their cat has taken one swipe, found it to be objectionable, and never touched it again. Carpet may be found elsewhere in your home. When you are trying to teach your cat to scratch a post and not household items, it's best to provide a post covered in a material that isn't found in other spots in your home. Your cat should be able to clearly tell the difference between the items she is allowed to scratch and those she is not. Therefore, carpet is not a good choice for many households. Sisal is an excellent material for providing the necessary distinction between scratch-appropriate and scratch-inappropriate items. 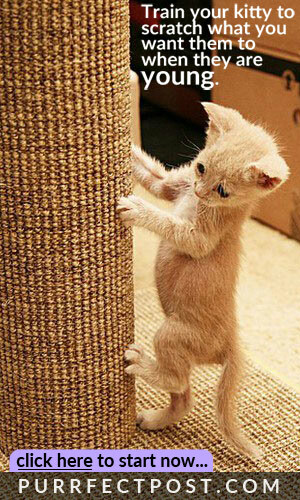 Many cat scratching posts are covered with sisal rope, but sisal fabric is a better option. As a cat scratches at the rope, its fibers become dislodged and are sharp. This will dissuade the cat from continuing to use the post. Conversely, sisal fabric becomes softer as it is scratched, encouraging more and more use. Furthermore, sisal fabric allows a cat's claws to slide through the material, shredding as they go. Cat's love this because they feel as though they are leaving a visible mark for other cats to read, plus it feels great to them. In contrast, the scratching action of claws on sisal rope is constantly interrupted by the bumps; it is not a smooth, satisfying scratch.